New chemical "bitter blocker" makes foods taste sweeter. Waiters and table service in Times Square? The omnivore’s other dilemma: expanding access to non-industrial food. Biotech alfalfa puts spotlight on coexistence. Sweet! Candy eaters surprisingly slimmer. Growing interest in urban farming in India. Create a vertical garden from cinder blocks. Grow radishes to test your garden soil. Seed starting questions asked and answered. Aye! I wish I could take credit, but the grow light is doing all the work. I've got that thing barely an inch over the plants. 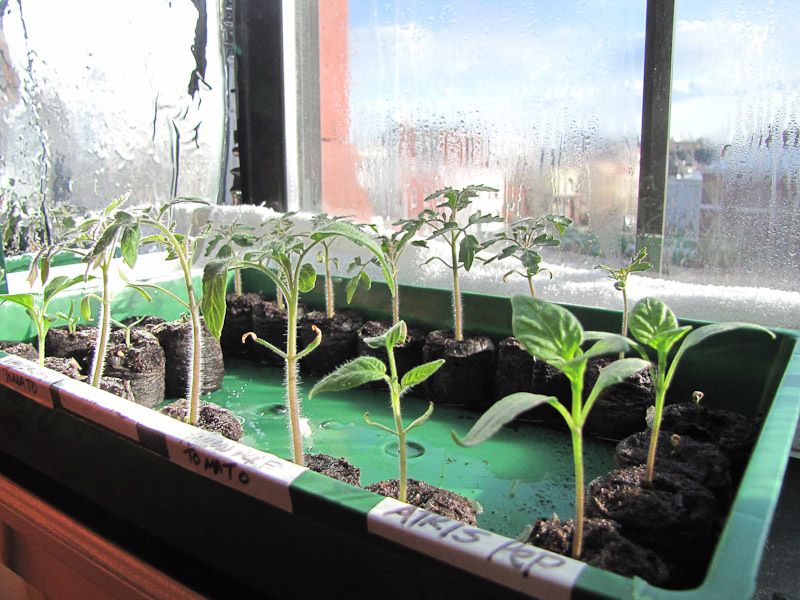 I wish my tomatoes looked like that...my little seedlings don't seem to want to grow up! Thanks for the blog, it has been very informative and inspiring! Hi Charm City, thanks for stopping by! I'm glad this blog is of help to you, good luck on your garden! I like your plants, probably need a few lessons to get mine to stand upright like that.